NFL Forum :: - How do you feel about the RB situation? Can the 2017 Packers deliver that running game ? If Montgomery stays healthy, I can't see why not. Obviously the line as well. Both Williams and Jones should provide tremendous spell options. Before that ankle issue, Monty was the jackknife of the offense. He was split out and then basically took over Cobb's role in the backfield because he was more explosive. Not sure how I feel about him showing up to camp at 225. What happens with Monty and others with the sickle-cell trait, is that they have one defective copy of the gene that codes for hemoglobin and one good copy. So they have both "sickle" red cells and non-sickle red cells circulating through their system. Normal red blood cells "deform" themselves in order to squeeze into and through the tiny micro-capillaries, thus delivering oxygen and removing CO2/ waste products . 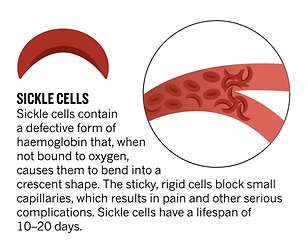 When you have sickle cells, they don't deform as well and they can't get deep into the muscles - this leads to lack of oxygen and a build- up of wastes, especially during heavy exertion. The linked research paper from Cadmus also suggests that under heavy exertion and oxygen depletion, even some of the healthy red blood cells will sickle too. So under normal conditions, Monty is fine. Under exertion or dehydration, the risk profile changes. During heavy exertion, he may struggle and GB has to manage that because there are some nasty sequela that can arise in these patients. Managing hydration and exertion levels (up-tempo offense) are part of his future in GB and fortunately he has the best care and advice available. He took over Cobb's role in the backfield because he was about 15-20 pounds heavier. I feel like there's this mindset that Monty was a little guy who's bulking up to play RB, and that's just really not the case. Monty weighed in at 221 at the combine and still had a 40.5" vert and a sub 7.00 3-cone. He tried to cut some weight to play receiver, but the guy likes having the weight on. Keeping him out of the weight room is the hard part. And he's almost certainly getting the first crack at being the starting RB; he's not a gadget player anymore and that won't be his role. palmy, if you think it's not the sickle cell (which I absolutely believe), do you have any insight on why he loses his speed so quickly on long runs? There's just been a weird number of plays where he gets in the open field and accelerates away from everybody, only to have them catch him from behind a few seconds later. I'm not Palmy, but I think the answer to your question is that he's not track fast. A RB who knows where he's going and gets there quickly and in control will always look to break away as they blow past people moving parallel to the line. It's when guys start moving in the same direction that 4.55 speed becomes slow in comparison to NFL DBs. Pretty much. Like many in Monty's mold, he's more quick than fast. What has always stood out to me about Montgomery is his ability to be elusive. I just remember his highlight tape when we drafted him, I got bored watching him find at least 6 YAC on every play. People also like to blame the 2015 offense on Jordy being injured, but it really took the hit when Montgomery went down. We were still generating decent offense that first 5 or 6 games as I recall. His size is perfect for RB, but I agree there is something that seems different, maybe his upright running? I fear that teams didn't take him seriously and that may cause a shift, but so far his production and skills look the part of a nice Packer receiving back. "mybed.com is reporting that im trying to sleep"
"Montgomery said he felt like a rookie entering his first offseason, which wasn’t far from reality. A year ago, ankle surgery kept him in a walking boot until July. He didn’t run for months. Forget being unable to train as a tailback. Montgomery couldn’t prepare for the season, period." Running back Doug Martin was suspended for four games for PED usage at the tail end of last season and there was talk he could be traded before the 2017 NFL Draft. The Draft has been and gone and Martin still remains on the Buccaneers rosters, as Tampa Bay failed to secure a suitable replacement vis the draft. The Green Bay Packers also failed to have improved their Running Back situation via the draft and after losing Eddie Lacy to Seattle via free agency are now looking for a lead back and with the free agency options slim, a trade is their only real option. Because Martin was suspended, his previously guaranteed $7 million base salary for the 2017 season is no longer guaranteed. Additionally, Martin is banned until Week 3 of the 2017 season and are expected to role with Jacquizz Rodgers as their starter with Charles Sims as their change of pace back. It is understood the Packers have made contact with the Buccaneers to start discussions on a possible trade option and have gone as far as to say ‘Name your Price’. Martin would provide the packers a genuine running game and take some of the pressure off star quarterback Aaron Rodgers to move the chains all by his lonesome. The Packers current running backs on the depth chart are Ty Montgomery, Jamaal Williams, Aaron Jones and Devante Mays. Although Ty Montgomery produced some excitement in 2016, the packers still need a lead back to keep the chains moving and Doug Martin could be the perfect solution. It's so stupid. I'm guessing this "journalist" thinks that if a team doesn't draft a position in the first round, they didn't address it. If we didn't like any of our RBs why even waste a draft pick on them at all? "...former Green Bay Packers RB Brandon Jackson is back with the organization as a coaching intern"
One of the best in the business at pass protection. I hope Ty is glued to his hip. "I did some reporting on the Packers before the NFC championship game but didn’t get to use it after they lost to the Falcons. One story, from Shannon Turley, Director of Sports Performance at Stanford, Montgomery’s alma mater, stood out. He said a scout from the Arizona Cardinals called him before the Packers drafted Montgomery in the third round in 2015 and said Montgomery would have been graded higher as a running back, and that players with his body type at wide receiver (6-0, 216) hadn’t fared well in the NFL. "